We’ve previously established, in part 1 of this article (Read here), that energy balance (calories consumed versus calories expended), is the main determinant of weight-loss or weight-gain, but obviously where those calories come from is important. 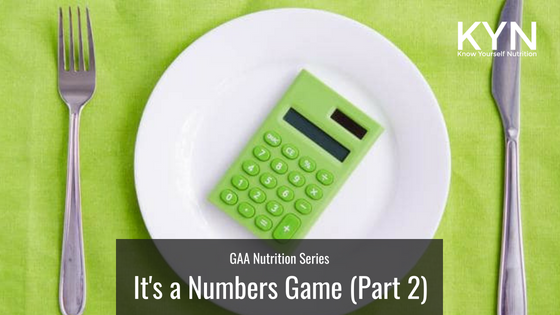 As GAA athletes, we’re not just concerned with weight-loss or weight-gain. We want to lose fat and/or gain muscle, all whilst fuelling our performance, and because of this, there is an element of accuracy needed around the macronutrients we consume. The calories we eat come from three main macronutrients: Protein, Fat and Carbohydrates. Protein is used in the growth and repair of muscle tissue (and other tissues, including hair, nails, connective tissue etc.) within the body. Each gram of protein contains about 4 calories. When considering how much total protein we should be eating, it is important to consider the amount and type of exercise being done. For example, someone who is quite inactive and is just seeking health, a minimum requirement of protein would be about 1g of protein per kg of bodyweight. For someone who is more active, and playing sports for example, recommendations would be closer to 2g per kg of bodyweight. For extremely active athletes, up to 3g per kg of bodyweight can be advised, but it seems that any higher than that, doesn’t provide any further benefit. So let’s take, for example, our regular 80kg Gaelic footballer, who trains 3 times per week with his club, goes to the gym twice per week, and maybe does a further yoga session. Let’s say he’s worked out that he has a caloric requirement of 3000kcal per day. A solid recommendation for him would be about 2g of protein per kg of bodyweight. So this individual will have a goal of 160g of protein per day. Since protein contains 4 calories per gram, we can find out how many of his calories will come from protein. We can then take this from his total for the day (3450 kcal) to find out how many calories will be made up of fat and carbohydrates. So we have 2810 kcal left to get from fat and carbohydrates. Fat is essential in the production and regulation of hormones and maintenance of cell structures, as well as the absorption of fat-soluble vitamins. It is also used as an energy source for the body, as well as being used in many other biological processes. For these reasons, its important that we are eating enough to satisfy these needs. Usually, this results in recommendations of a minimum of about 0.5g of fat per kg bodyweight. However, more optimally, recommendations would probably be in the range of 20–40% of an individual’s total daily calories coming from fat. This is generally dependant on individual preference, meaning that if someone prefers to eat a diet higher in fat rather than carbohydrates, we would edge closer to the 40% mark, and vice versa. However, we also need to consider the performance demands of the individual. If someone is doing a lot of high intensity exercise, as GAA athletes are, they will want to be consuming a good amount of carbohydrates. Note: With fats, it is important to consider the quality of your sources. There’s a lot to the topic of “healthy vs. unhealthy fats”, but without getting deep into it, Getting a varied range of fat sources in the diet will be important. At a basic level, I would recommend getting plenty of fats from plant sources (think avocados, olive oil, nuts), some from animal sources (meats, eggs, dairy), and limiting the amount of processed trans fats, from things like donuts, pastries, biscuits, highly-processed foods, etc. Carbohydrates are the body's preferred energy source in high-intensity activity, such as that experienced in a tough GAA training session or match. For that reason, it is important that we are consuming enough carbohydrates, so that we can adequately fuel our training and matches. When we eat carbohydrates, they are broken down into glucose, which is circulated around the body, and stored within the liver and muscles, (as glycogen) for when we need it for energy production. This flies in the face of the common myth that carbohydrates are turned into fat if not used straight away. Instead, carbohydrates will usually only cause bodyfat gain when it causes us to go into a caloric surplus. With the process and calculations outlined above, it is very easy for us to now calculate the amount of carbohydrates needed. The remainder of our calories (1950 kcal) will come from carbohydrates. Knowing that 1g of carbohydrate contains about 4 calories, we can then calculate how many grams we should be consuming daily. It's worth remembering that there will be a certain amount of adjustment and trial and error in order to find a carbohydrate and fat ratio that suits that individual. For example, for someone who was only eating 2000 kcal per day, eating 95g of fat per day might lead to them not having enough carbohydrate to fuel their training optimally, so they would need to adjust their fat intake downwards to allow for that. Obviously this is just for the individual above, and it will be different for everyone. So you will need to do the calculations yourself to find out what your requirements are. You can also use an online calculator to get an estimate, although these do vary in accuracy and methods used. Also, it’s worth remembering that these figures we’ve calculated are all based on an estimate of calorie requirement, and therefore there is some room for error in these calculations, so you’ll need to be able to adjust and apply trial and error. By this I mean, tracking bodyweight and other markers of progress in order to assess whether overall energy intake needs to be increased or decreased, as well as whether the macronutrient composition of those calories needs to be altered in order to enhance body composition, performance, recovery and enjoyability of the diet.